Accommodation of all types is available anywhere in Greece in a wide variety of types such as: island homes; luxury hotels; villas with swimming pools; cottages; traditional houses in town; studios and apartments, all of which are of good quality. These types of accommodation are found within and near the traditional settlements as well as in the countryside. Perhaps you prefer the sea or beautiful mountainous lush green forest settings if you search for the perfect accommodation you will find it here. Living in the lap of luxury is an experience that all people want to have at least once in their lifetime. Greece being the land of the Olympian gods has its fair share of accommodations worthy of an Olympian god where the well trained, discreet staff will cater to your every whim with charm and finesse. You will be fed the very same nectar and wines of traditional Greek fare the gods themselves enjoyed, so well appreciated by all who visit this spectacular jewel in the Mediterranean where Zeus was undisputed lord. The views offered by these truly exceptional accommodations are the very same spectacular vistas as those seen by the ancient Greeks through the ages. Most of these fine accommodations are situated close to or overlooking the sea where Poseidon himself reined the bountiful, crystal clear waters supreme. The days can trickle along with a lazy sun drenched morning, leisurely restful afternoon and fun filled party pace interchangeably or all together as only an Olympian deity can enjoy; giving you the very best of everything the land of the gods can offer, catering to your every wish and command. 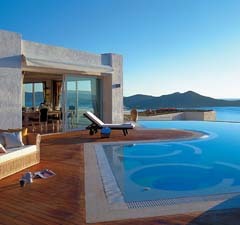 Luxury hotels can be found in many areas in Greece. Let us know where you want to go and we will find the appropriate luxury accommodation for you.